I was priviledged to talk to online entrepreneur Derek Armson last week. We talked about his search for an online marketing mentor. It was quite a revealing chat! So, explain why you felt you needed a mentor? “Well, when I looked at my business, I realised three things things”, he smiles over his artisan coffee, ” I had realised that my digital marketing skillset had a few gaping holes in it, first up.Then I also realised that every time I’ve achieved major success I’ve had a mentor showing me the way”. “Indeed, thirdly, I really wanted to move away from my SEO business into something where I wasn’t beholden to a small number of paying clients who could demand of my time as and when they wanted. Of course, supplying a service like SEO I have no problem with that call, but I didn’t really want it any more”. “So, I decided I wanted to develop a business around affiliate marketing and my own product development, and it was in those areas that I had gaps in my skillset”. So, how did you go about finding the right mentor? “Good question”, he laughs, “I went through a really defined procedure”. “I knew an Internet Marketing “pitch fest” event was coming up, so I went along and picked the best two speakers who I paced with and attended their weekend events”. “O.K, it cost a few quid, but I needed to know who was the right person for me. This was vitally important”. So, yes, I get that, but many people can’t afford to fork out that kind of money to find a mentor and then, presumably p[ay an awful lot more to get on to their mentor programs? “It’s a fair point. I was earning well from my SEO business. I was going to say I was fortunate, but that’s not true. I worked hard to build my SEO business and earned the right to do what I wanted with the money I earned. And, I could afford to do it becauise of the efforts I had put in”. “I would say that if you can’t afford to do it this way, research who you feel would be the right mentor for you. Most of these Guys have YouTube channels and websites where you can get a flovour of their content and style. They do tend to give away quite a bit of good stuff for free”. “The teaching style and the underlying ethics of the teacher where my core values that had to align”. So, where did you end up going? 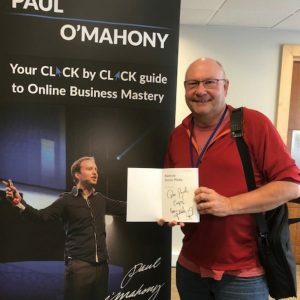 “I joined Paul O’Mahony’s Online Buisness Mastery program and Mastermind Group, I felt it was the best fit for me personally”. O.K, I have to ask…why? “Haha, I knew that was coming.I liked Paul’s teaching style, very easygoing and open. I liked his ethics, he has started a program to educate kids about money, I really liked that. And his Online Marketing Mentor course was straight forward and very modular. So, it was easy to dip in to the bits i needed”. There’s an extended article and video content about the full process on my website at derekarmson.com Have a read, it’s a good process I went through”. Thanks Derek I will, and I’m sure my readers will pop along and have a look. It’s been a while since I posted so I thought I’d better add some musings. And, as it happens, it’s quite opportune as I was transported back to another world that time (well I) had almost forgotten this week. I was chatting to some old recruitment friends of mine and was introduced to a Guy called Jon Eyers who is MD and owner of a boutique agency out of Milton Keynes in the U.K called Harvey Thomas. Now, it’s fair to say I’m a tad long in the tooth these days but even I hadn’t realised it was some 15 years since I turned my back on the recruitment business. You see, I’d got really frustrated at the way the market was going. I was supplying very specialist IT programmers to the Investment Banks. It was a huge market and I was a niche player. The big recruitment companies came in, swept up all the HR departments with a Recruitment Process Outsource model and then refused to deal with the niche players. If they did margins were down to the bone and, for the niche player, they broke the business model. I was no longer even allowed to speak to line managers I had five year relationships with. So, in frustration I walked away. To be fair I’d done my time – 25 years in the business, so it was time for a change anyway. However, meeting Jon was a breathe of fresh air. Here’s a Guy who does recruitment the way I used to do it, and he is loving it. So, I had to find the secret of how he was still using techniques I thought had long gone and using them very successfully. “It’s all about the market”, he smiles, “but you knew that”, he laughs this time. Yes, well I suppose I did, and it makes me admit to myself that I was the reason I walked away. I’d had enough and I used the changed market conditions as an excuse to do something I knew I had to do anyway. “The market has polarised, in my opinion”, says Jon, “it is the situation you mention whereby the RPO model has sewn up a lot of major corporations. So, if you are supplying into those large companies, you simply have to play by their rules”. “Is it good for these companies? I doubt it, simply because they are not getting full market access. The candidates they can access are limited by supply going through one bottleneck. Yes, they probably save money on their recruitment, but, do they hire the best talent? Probably not”. “And, to boot the job of a “recruiter” supplying into such models has been devalued to not much more than a glorified admin clerk”. I have to agree with Jon here. It’s become a mix and match admin job. The skill of the recruitment consultant has been eroded away as they don’t now need to sell or work hard for the vacancies, or indeed understand necessarily what they are recruiting for. The job has been “dumbed down”. I was intrigued as to how Jon is bucking the trend. “As I said, Jim, it’s all about the market”, he takes a sip of tea and smiles over the rim of the cup. It’s a fair cop, I reply. “We supply a very distinct niche, a niche that cannot do without our services but that cannot plug in to the RPO model. It’s a very nice place to be”. I know Jon is now going to crow about his market, here he goes! “You see, we supply into Pre-IPO and Venture funded Cloud Software start ups. It’s an incredible and vibrant market. All you need to do is look at the number of new product launches and apps you now have on your mobile devices”. “All of these products and apps need developing, so we supply the software engineers, project managers, customer success staff etc in the software vendor market”. “As cloud technology comes of age we are seeing massive demand for saas software engineers, pre-sales recruitment and software sales recruitment as well. The market is going crazy, but some of these start ups are tenuous. We need to manage both the clients and the resourse to keep that market as near balance as we can”. 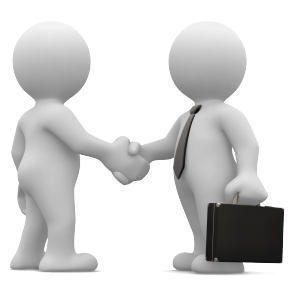 “We manage the careers of our candidates, and the resource of the projects of our clients. And, you only have to look at the Sales Force business model to know that, if you bring the right Cloud based offering to market, you are going to make a killing”. This is recruitment in the traditional sense. Managing and understanding client issues and projects. Their needs and their points of pain…and then being able to provide a true recruitment solution. It;s great to see traditional recruitment skills being exercised and a company thriving by doing just that. I take my hat off to you Jon. You can find Harvey Thomas by clickling this link. Most animal lovers would be very excited about the prospect of working with pets and animals day in and day out! Having your own, personal doggy day care probably seems like a great way to earn a living. Going to work in an area you love is one thing hardly any people achieve, and maybe it seems like a dream but it is possible. 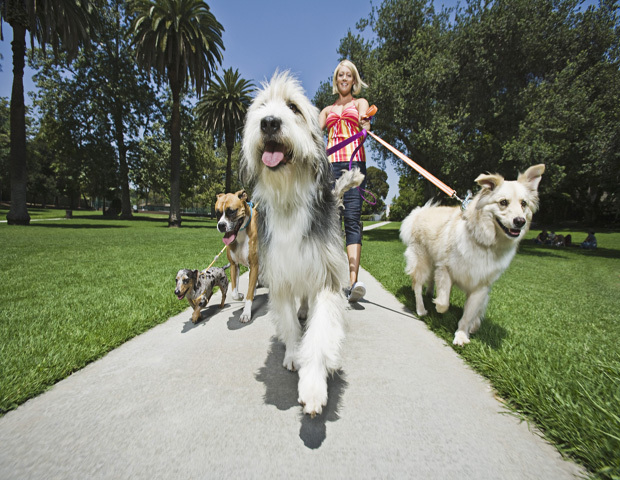 If you are a dog or cat lover why not consider a pet sitting franchise? The reality is, however, that starting any new business from scratch is tough. Certainly most geographic areas have the demand, however getting all of the business processes such as, invoicing and gross sales cycles set up takes a lot of time and is pricey. This is where the franchise business model comes “into its own” as all of this base work is alreadt done for you. Using the franchise enterprise setup will help you to take the know-how that you have learned about animals at the moment and build a profitable business from your knowledge. The main benefit in running a franchise pet sitting or care operation is that every point of your business plan will already be set in stone. This covers the kind and amount of insurance that you’re required to have, certification for operating a a reliable company and all necessary advertising and marketing strategies.There is no guesswork with this business setup and so, you possibly can spend much more of your time and energies doing what you like, rather than tussling with the business end of your venture. Another major advantage in owning a pet sitting franchise is the reality that this may help you capitalize on the established goodwill of an already recognized brand. You don’t have be concerned about constructing a superb brand for your self within the existing market..
People will trust you with their dog walking and pet care duties. Why? Simply because you are backed by a name that they already know. Pet house owners, quite rightly, love and cherish their little beauties and usually tend to want to give their business to a reputation they already know and trust.This is one of the major benefots of opening a franchised operation. You need to do more than put up posters or put an advert in the local newspaper. If you aren’t properly certified and don’t have the correct insurance, you possibly can be liable to all sorts of claims and actions. Consumers have come to anticipate a lot more from these services and so, individuals who own doggy day cares are required to have a legit business setup. Owing your personal pet sitting enterprise franchise will subsequently be stress free and a desirable and profitable experience. Peter and Julie Maxted of Pets, Homes and Gardens run such an operation. 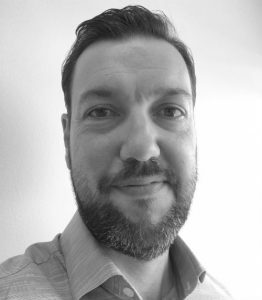 “We loved our pets and we started a pet sitting business “on the side” about ten years ago It was only when we met Dave Hardisty that we started to formalise all of our systems and processes. He was a great guy with processes and we quickly realised that we had the opportunity to franchise out the business. He even tested the model with his own widfe, melanie, who runs out West Sussex franchise. We now have twenty franchisees, so if you’re looking to work a business that involves pets, talk to us. To learn more about how to set up a pet sitting and pet care franchise business, go to this link and read more on Pets, Homes & Gardens. If you were to stop and look around the room you’re in, chances are you’ll have a window close to you. It may have curtains or blinds to give you privacy and control the daylight entering the room, but there are other colourful options you can use to control the transparency of windows, cut down glare and UV radiation from the sun and enhance the security aspect of glass. I’m talking about applying a layer of window tinting film, which can do all those things, as well as add a splash of colour and a touch of artistic style to a room or office space. Expert window tinting film specialists Tintmaster, based near St Albans, have been installing window tinting in thousands of homes, commercial and public buildings and vehicles for some 25 years now. The experts there have used a variety of designs and techniques in many homes, offices, schools and even sports stadia such as Lord’s Cricket Ground in London. Commercial buildings belonging to both private companies and government authorities have brightened up their office space and added tinted window film for numerous reasons, including adding some corporate flair with applying company and logo colours to office windows. 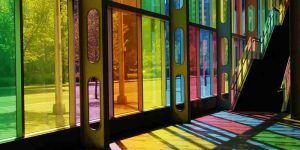 The tinted windows also brightens up the floor of buildings when the daylight and the sun shines through to form pools of coloured shade. Tintmaster are also often asked to add additional security to outside windows using safety window film. A layer of this ensures that the building meets existing building regulations for health and safety legislation. “If a window is broken, it won’t shatter into many different fragments if you apply safety window film to it. Instead all the pieces stay stuck together, helping cut down or remove sharp shards of glass falling into the room inside,” Martin tells me. Window tinting seems to me to be part art-form and part practicality. It’s quick and easy to add, especially when applied by professionals like Tintmaster’s installers, and it can have a stunning effect on the way buildings and cars look. Becoming a glass window tinting specialist like Tintmaster is a great idea for any small business. Go to tintmaster.co.uk or https://www.facebook.com/Tint-Master-1904700776422358/ for more information on Tintmaster. When it comes to starting a new venture in business, the timing of when you take action can be critical to the success of the business. It’s always easy in hindsight to look back and see when exactly the best moment would have been to invest in something, or move to a new technology, but much harder to see the trends at the actual time. Back in 2002 Doug Bates and Chris Mason wanted to move on from their jobs in IT recruitment for City investment banks. Both men wanted to team together to form their own recruitment business but they wanted to focus on recruiting for the new emerging and exciting – and at the time relatively unknown – areas of digital marketing and eCommerce. 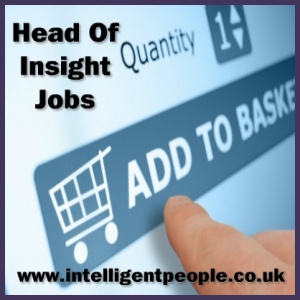 So Doug and Chris created the St Albans, Hertfordshire-based recruitment agency Intelligent People, which immediately attracted what are now giant global eCommerce corporations, but at the time back in 2002 were fledgling online retailers, just starting out and unaware of the huge way in which the shopping public would embrace Internet shopping. It was a natural progression for Doug and Chris to bring on board more recruitment consultants who had worked in these industry areas, so they had first-hand knowledge of what skills and talent the clients were looking for, and were up-to-date and fully versed in job roles that were evolving as technology became more sophisticated and applied in a number of varying ways. “We pride ourselves on our industry knowledge and all our recruitment consultants stay ahead of the game in developing technology and job roles that are emerging as a result,” Doug says. Successful businesses these days have to be aware of and competing in a huge range of online and mobile marketing, including one of the first and still popular method of email marketing, search engine optimisation and search engine marketing to drive more traffic to online sites, loyalty marketing which has moved online and onto mobile devices mainly in the form of apps, and the latest types of location-based marketing, which geo-targets prospects when they enter a specific geographical location. So maybe the answer is not to always accept the conventional way of doing things, but stay alert and anticipate industry change, especially as science, technology, and communication moves forward to affect society as a whole. “Sometimes it can just be an inkling that a revolutionary shift in technology is coming,” concludes Doug, looking smug as he leans back in his chair. The busy lively office of recruitment consultants all around us energetically searching for the best skilled and talented people to become their clients’ next new employee is testament to the fact that Intelligent People is a thriving recruitment agency. If Doug and Chris are smug about their success, I’d say that they have every right to be so. In the present unpredictable times, the market has been hit rigid by recession and, as a consequence, a number of citizens have been badly affected. Thousands have lost their jobs and countless have had to close down their own business. In such circumstances, you have to to think creatively and come up with new and very interesting business ideas to prevent yourself from getting bankrupt. If photography is one of your hobbies, then this is the correct time to turn it into your own profession. You will first have to be present at a crash course on Digital photography. Once you are through with it, you might start your journey as a digital photographer. Based on your individual choice, you may prefer from a host of options such as wildlife digital photography and under-water digital photography. 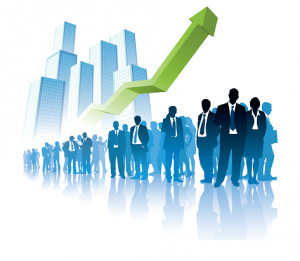 This profession will not only offer you creative satisfaction, but also an excellent income. Besides, you will not at all get bored doing your job. Pursuing web designing is certainly one of the superior ways to explore your imaginative skills. As an expert web designer, you will be required to merge the textual, graphic in addition to other elements of a web site to build up a good-looking layout. Web designing is a procedure through which the visitors are capable to access the web pages at a sole platform with a lot of graphics, images, links as well as texts, etc. Web designers are in vast demand and you certainly won’t starve once you create working as a web designer. A number of citizens are opting for affiliate marketing with a trust to save their dipping financial ship, and they certainly won’t be dissatisfied. Affiliate marketing leads the contest when it comes to opening a home-based business. Besides, you can set up affiliate marketing program even if you are having limited cash, since you are not actually required to invest any extensive amount. In addition, you attain work as per your convenience. It will be an extremely good option for you if you are looking to create quick money with no really putting in a lot of efforts. Have you got a style for fitness? Do you be keen on giving suggestions to others on how to stay fit? Then, the occupation of fitness instructor is tailor-made for you. With rising number of people enrolling themselves in nearby gyms, you will certainly be able to make fast money. Those women having great cooking skills can make use of their ability in launching an excellent food catering business. 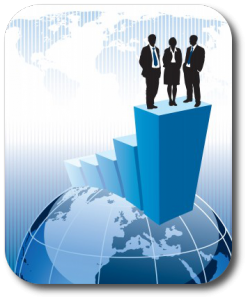 This delicious business thought can be further streamlined as per the proficiency of the entrepreneur. If an important person is good at baking, then orders for all the delicious cakes and cookies can be taken and executed from your home. They can begin by doling free delicious food samples so that community get taste of the specialized cooking. Those women who have outstanding written expression can start writing contents for a variety of websites. They can also start on their own blog posts that can be monetized quickly after its start on. This is an interesting business idea as it calls for no investment. Thus, you really have plenty of options at your disposal. All you require to do is decide which is the most excellent for you and then continue accordingly. Once you make a decision the kind of job or profession you desire to pursue, you may log on to a website to find the most excellent fobs for yourself.